Since 2012, the CSC has been conducting a cycle of evaluation surveys designed to generate insight into the experiences, achievements, and difficulties of our alumni. By mid-2015, we had sent a survey to 100% of the members of our alumni network for whom we had current contact details. In this report, we present a detailed analysis of both the trajectories of individual Scholars through the labour market, and the catalytic impacts that have been generated by their activities. An annex for readers interested in further methodological details is also available. 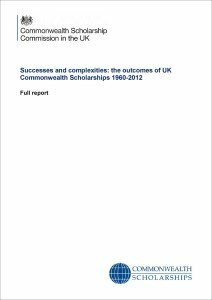 This report updates and extends our paper: Trajectories and impact of UK Commonwealth Scholarship and Fellowship Programme alumni: Interim quantitative analysis. For additional, detailed stories from some of our alumni, see our Evaluation profiles.